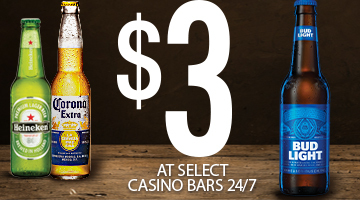 Come enjoy a Corona®, Bud Light® or Heineken® for only $3! Management reserves all rights. Must be 21 or older. Please drink responsibly. Corona® and Heineken® are not sponsors of this promotion. ®2016 Corona are registered trademarks of Anheuser-Busch InBev. ®2016 Heineken are registered trademarks of Heineken International.